Example of what compliance packaging may look like. Inventory checks are easier. It is far simpler to account for individual unit packages than it is to account for multiple containers based on weight. Pre-packaged cannabis is faster to process. 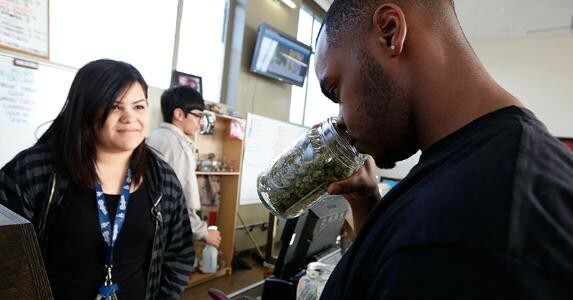 Budtenders can make sales much quicker by scanning barcodes on pre-packaged cannabis instead of weighing out customer orders at the point of sale. Selling packets of a product creates less room for error by removing several steps from the sale process. User inputs on scales and weight calculation are removed at the storefront, allowing for accurate sales with lower chances of mixups. Pre-packaged cannabis loses weight if left for too long. The weight of product during packaging is different at the point of sale. Dispensaries need to know what stock is fresh and what stock is growing stale. Packaging cannabis for sale affects product visibility. Customers do not know about the quality of the product inside a pre-pack. Transparent packaging and keeping fresh packages help ease customer fears. Customer experiences may be affected by selling pre-packaged cannabis. Packaging means that the customer loses out on interacting with the sight and smell of the product. It’s best to keep a small open jar of cannabis for customer experience purposes while still selling in a packaged format. Customer experiences like this are unavailable with a pre-packaged system. For dispensaries, selling pre-packaged cannabis makes operational and logistical sense. Unit values are easier to work with, there is less room for human error, and sale processing speed increases. However, dispensaries using a pre-packaged system must also be aware of the potential impact to customer experience when it comes to shrinkage inside of packages, lower customer visibility, and loss of intimate budtender-customer interactions.